Why is it that you can never find what you're looking for when you're looking for it? 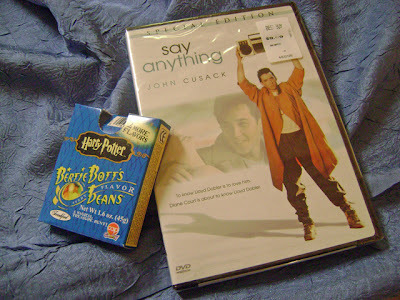 I saw a VH1 special about stars of the 80's last weekend and it reminded me of my love for the movie, "Say Anything". You know the one. Lloyd Dobbler holding up the boom box outside of Diane Court's window, professing his love to her via the song, "In Your Eyes". Both the movie and song happen to be my favorites. I went to Walmart and Target looking for the movie and couldn't find it. Which drove me crazy because I saw that movie everywhere when I wasn't looking for it. I finally found it at Best Buy last night. While standing in line, I saw a box of Harry Potter Every Flavor Beans. 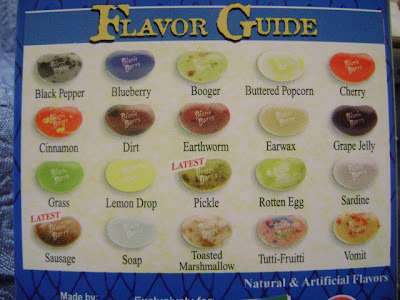 For those of you who don't know, the Every Flavor Beans are jelly beans that come in nasty flavors such as black pepper, dirt, earthworm, earwax and rotten egg. They threw some good ones in the box too; cherry, buttered popcorn and grape jelly. I guess you're supposed to use those as "chasers" to remove the taste of the nasty ones. I finally got the nerve to try them. I'd heard they were nasty, but of course I wanted to try them for myself. I tried "soap" first, which really didn't taste like the soaps I've tasted. It was nasty as hell and my stomach didn't feel too good after I ate it. But I figured I'd be a trooper and keep going. I searched the box for "booger", because I wanted to see if it would taste like those of my childhood (Don't pretend that you didn't eat a booger or two (or 10) when you were little...either by mistake or on purpose). Ah, the memories. I found one I thought was "booger", but it ended up being "pickle". The more I chewed, the more my stomach started to churn. But I kept going. After trying "vomit" I couldn't take it anymore, and immediately searched the box for one of the chaser beans. Then I figured I'd try one more. The "booger" one. But as I searched the box for it, the thought of eating it literally made me nauseous and I couldn't do it. I wanna know who in the hell came up with these flavors. More importantly, I need to know why the hell I chose to eat them.